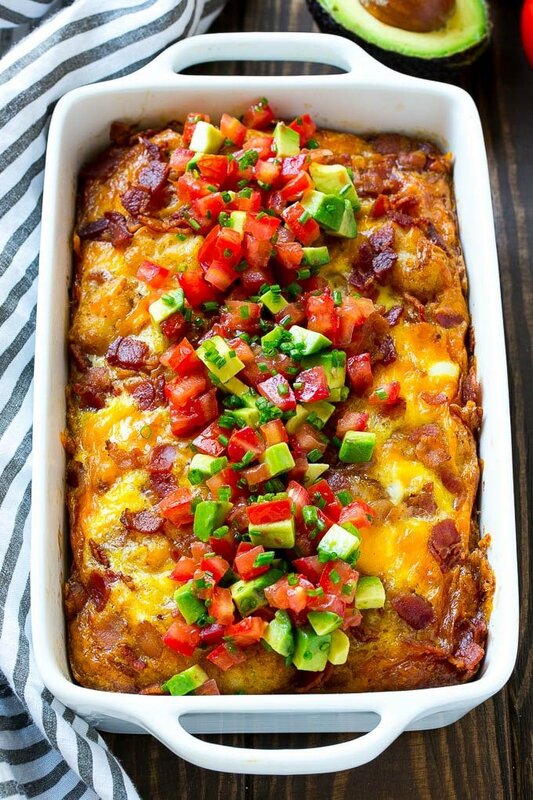 This breakfast casserole with bacon recipe is loaded with eggs, cheese and bacon, then finished off with an avocado and tomato topping. The perfect hearty breakfast for any occasion! This bacon and egg casserole is so quick to put together and feeds a crowd, it’s great for a holiday brunch or lazy Saturday. I am most definitely a savory breakfast person. As delicious as french toast and doughnuts are, they just don’t keep me satisfied for very long. 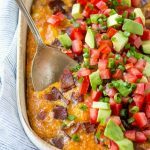 I almost always have eggs for breakfast, and this breakfast casserole with bacon is the perfect way to feed an egg loving crowd! This casserole is chock full of eggs, potato tots, crumbled bacon and cheddar cheese. The finishing touch is a fresh and delicious avocado and tomato topping, which cuts through the richness of the casserole. Plus who couldn’t use a few veggies in the morning?! For this bacon and egg casserole you’ll need a dozen eggs, cooked bacon, shredded cheese, and frozen potato tots. 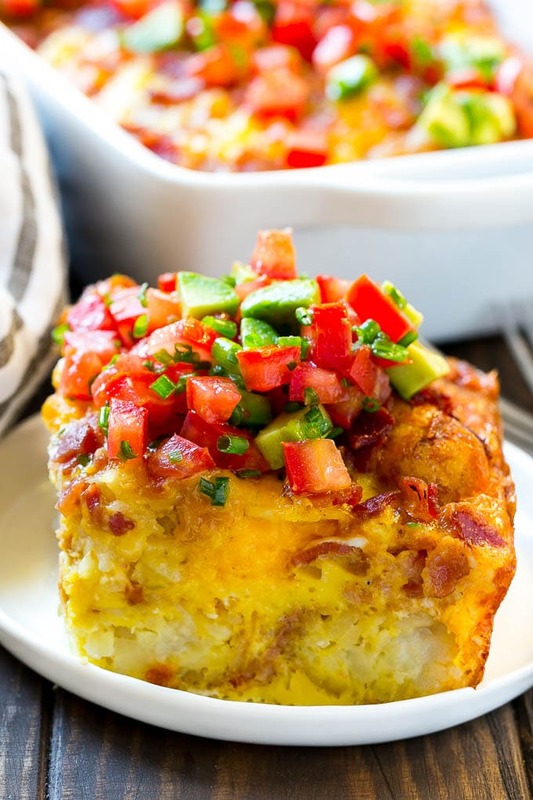 The potato tots are layered in a baking dish and a mixture of eggs, cheddar cheese and bacon is poured over the top. This breakfast casserole with bacon then goes into the oven to bake to golden brown perfection. While the casserole is in the oven, I make the topping which is simply chopped tomatoes, avocado and chives. If you don’t have chives, you can also use green onions, basil or parsley. I just love the added freshness in the topping, it really makes this dish special. Simply cut your casserole into squares and you’ve got a hearty breakfast that will satisfy even the biggest appetites. Sometimes I even serve this casserole for dinner! My entire family loves this dish, it’s our go-to casserole for breakfast and brunch. You can easily customize this casserole to your family’s preferences by using ham or sausage instead of bacon. Other great additions to this recipe would be sauteed vegetables like peppers and onions, the possibilities are endless. This breakfast casserole with bacon is the perfect choice for a holiday meal, or you can make it at the beginning of the week and reheat a square each day for a quick breakfast on the go. My family has started requesting this one almost every weekend, it’s just that good! 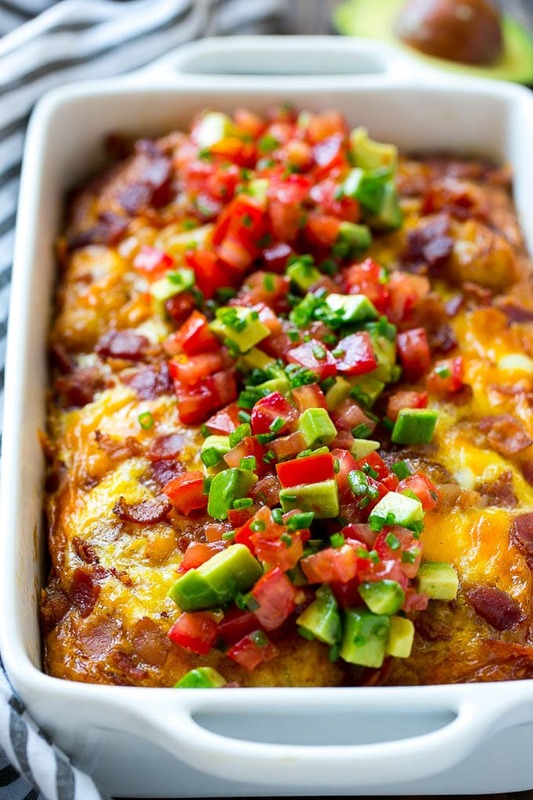 This breakfast casserole with bacon is loaded with eggs, bacon, potato tots and cheese, and is topped with tomatoes, avocado and herbs. Place the potato tots in a single layer on the bottom of the pan. Pour the egg mixture over the potato tots. Place the tomatoes, avocado and chives in a bowl; stir to combine. Season to taste with salt. No need to thaw the potato tots, they go straight from the freezer to the casserole. You can substitute one pound of cooked crumbled sausage for the bacon if you prefer. This is a sponsored post written by me on behalf of Green Giant®. This post was originally published on December 2, 2016 and was updated December 18, 2017 with new photos. Thank you for the recipe! I made the casserole for a Easter brunch and it was a big hit! I used low sodium sausage and no one couldn’t even tell. Yummy!!! None of the comments here are very useful. That being said – the flavor of this casserole is very good! BUT – the eggs kind of disappeared. Next time I’ll add 6 more eggs and it will be divine! Best casserole ever.